As a birdwatcher and tourist guide, I often go birding in every place that I visit including Bali. There are several places in this beautiful island where visitors can go to watch birds and see unique tropical vegetation. One day, I went to Ubud and enjoyed birding in rice field areas just a little outside of the crowded town. I used a mountain bike to explore the rice field. 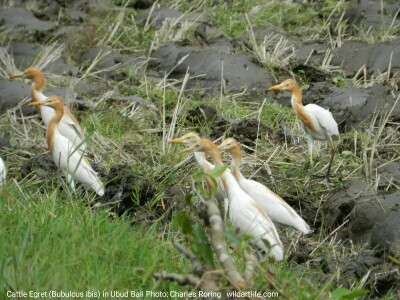 As I rode my bike, I saw a large flock of Cattle Egret (Bubulcus ibis) walking behind a farmer who was plowing his farmland using a hand tractor. They were eating worm that was exposed from the soil that had just been turned by the tractor's blade. Their whole bodies were white but the heads, throats, chests and rumps were covered by light brown feather. Their bills were yellow. The farmer was not concerned or worried about the presence of the cattle egrets around him. He was fully concentrated in his works plowing the rice field. Most visitors go to Bali Barat National Park for Bali Starling, Java Sparrow, Orange-breasted Green Pigeon and hundreds of other bird species. But other places such as the slopes below Lake Tamblingan, Besakih in Mount Agung, Nusa Penida island are worth trying. I also saw Scaly-breasted Munia (Lonchura punctulata). 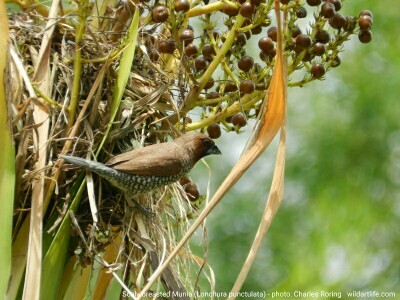 This bird was also called Nutmeg Mannikin. The underpart feather of the munia particularly around the belly looked like the scales of fish. He was busy picking small berries in a tree when I saw her and took a picture of her. The birds occur not only in the forest but also in farmlands and residential areas. Farmers often consider them as pest because they like feeding on rice grains in paddy fields. They can suvive in towns and cities because they can pick up grains of food wastes from houses and restaurants in residential areas. In other words, we could see birds that feed on food wastes in the city as scavangers. They play important role in cleaning of the city. Field guide birding book such as "The Photographic Guide to the Birds of Indonesia." If you want to enjoy birding in other parts of Indonesia, I highly recommend that you go birding in Raja Ampat, Tambrauw, North Sulawesi, or lower montane forest of Arfak mountains. I can meet you in Bali and organize your birding trip to the island. Birding in remote region is a fun activity. If you want me to accompany you to go birding in Bali and other parts of Indonesia, you could contact me (Charles Roring) by email to: leororing@gmail.com or send whatssapp message to: +6281332245180.